All views are my own, and are not to cause any offence. I appreciate and respect any journey that others are going on, but felt that some people would benefit from reading my story. I am not a before or after story. I am not a series of pictures showing how I went from bulging back flab, to visible collar bones. I am trying to recover from the diet industry. It’s important to me that I write this post. It’s important because over the years I have seen myself go from a size 10 to a size 18 and back down somewhere in the middle again. I have mentally beaten myself up, stood in front of the mirror and squeezed at all the pieces I wish I could just rip off. I have weight-watched, calorie counted, slimming-worlded, clean eaten, and I have been left more miserable, and fatter after each and every one. I am desperately trying to recover from the diet industry. I have now started to try and eat intuitively; the mad thing is I didn’t even remember what hungry felt like. I was always stuck in an in-between of near starving or scoffing down my meal as soon as I was ‘allowed’. I want to talk to you about my final straw. My final straw for dieting (although don’t get me wrong I have flirted with the idea in my head again and again) came from attending Slimming World earlier this year. In a month I had lost half a stone, and most of my happiness. I don’t quite think the group I attended knew what had hit them. I am a confident person, will talk to everyone, and actually really don’t hate myself. I turned up, as I would to any meeting with my hair pinned nicely and a pretty frock on. No matter how my dieting life has been, I have never believed that I don’t deserve to feel beautiful or dress well. The aura in the room was dark. Sad, dark and depressing. I had made a pact with myself to stick it out for a month, so I did. Now what made me join Slimming World? One day whilst doing some work on my caravan I noticed in the sunlight that I have a varicose vein on my thigh. My skin is very thin from years of eczema and steroid creams, and all I could see was this vein, and the starting of purple spiders: old lady legs at 25. Horrified I thought this was something I needed to stop in its track before it could get any worse. After speaking it over with my boyfriend, he agreed if it would make me happier and healthier then sure he would support me. When we were living separately, Wednesday night was our date night, and now before date night every week I was attending a place where only certain food groups could be eaten at certain times, and food was speed or B or A. It was confusing. In fact I put down the first weeks loss to being so confused I didn’t eat all that much at all. Date night went from being a meal out, walking the dog to get a bottle of wine, and picnics in the garden; to my partner having to hold a grown woman cry about how she was being made to feel underachieving and worthless for being just a little bit fat. My type 1 diabetes (which you can read more about here) was causing me havoc, and each time I had to treat a hypo with sweets, lucazade and toast I was feeling guilty. Guilty for treating my illness. One weigh day I even considered not treating my hypo till after weigh in so I could be just that bit lighter, if only my legs were strong enough to carry me to the scales before I passed out. The month ended, and that’s when I discovered intuitive eating, as recommended by a very good friend of mine. Now the weird thing about dieting is that everyone is proud of you for being ‘good’. You might be miserable but well done you. No. these are not the things I want to be congratulated on. 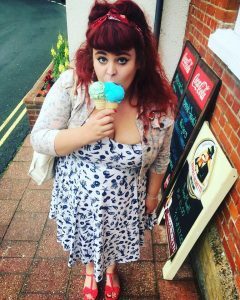 Losing slimming world and the diet industry was the biggest weight I could’ve dropped. Do not be fooled, the diet industry is a business. They want some success, but failures and return customers make them money. One poor lady I made an effort to sit next to and chat with every week had lost 3 stone, but for her goal about another 9 was needed. Each week she would gain and lose again, stuck in a perpetual cycle of misery. Eating intuitively isn’t easy, and the first step is acceptance. Accepting your body as it is right now. Not 2, 4, or 10 dress sizes smaller, or pre the weight I had gained at university, but right now. It’s starting to look after your body and talk about it as if it were a child. It is seeing those photos on Facebook at an event and instead of saying ‘geez look at my double chin’, saying ‘hey how clever are you to have even got to this event? !’ it is accepting that I have a round face, and a round tummy, and that when my eating is no longer disordered from years of dieting that this may change, but it equally may not. It’s realising that I spend hours on my feet every day, followed by hours of sitting down, and that my size 8 friends have also got varicose veins. Intuitive eating is hard. It ranges from feeling on top of the world, to having someone say ‘wow you’ve eaten a lot of bread with dinner’ and bursting into tears, because they can’t see how hard you are trying. It is feeling touchy when friends much thinner than me talk about how they need to lose weight before holiday, and feeling angry when people talk about food as being ‘good’ or ‘bad’. Right now, where you are is okay. You have permission to eat and enjoy food. You can wear the pretty things, climb mountains, kiss under the stars, and wear a bikini. When we don’t do these things we give the diet industry power. Don’t give them this power; this is your life, and your story. Now we are living together, by boyfriend has seen how most days I don’t wear makeup, after a night of drinking I bloat to the size of a whale, and surprise surprise he hasn’t left me. Intuitive eating isn’t saying that every day feels perfect; and actually I do want to be healthier. But healthy to me now means walking the dog for an hour a day because it wakes me up, makes me (and the dog) feel darn good, and is not based on how many calories I can burn. It is choosing a glass of water over a glass of pop because it hydrates me more. It is eating a starter, main, AND dessert, and not punishing myself after. It is putting the scales away because my worth is not based on a number. It is difficult, but I am getting there. Some days are hard. Some days feel impossible. And some days I just feel angry that I was ever lead down a path that disordered my eating. I am an incredible friend, thoughtful daughter, loving partner, and founder of a growing business. I also manage to pay bills on time, make sure the laundry is done, walk the dog, feed the cat, rescue hedgehogs, manage a chronic illness, and not forget birthdays. Never again will a loaf of bread make me cry.